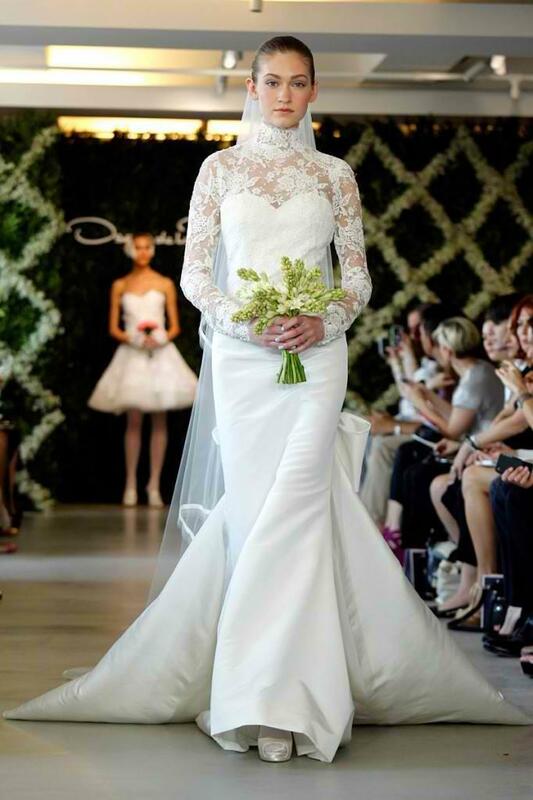 Are you looking for long sleeve wedding dresses? You have come to the right place! After going through the preparations of a wedding, you realize it’s too cold to wear that backless lace gown you’ve been planning to wow everyone with when you march down the aisle. It may not be easy finding that dream outfit while at the same time trying to shield yourself from the elements. However, there are some long-sleeved wedding dresses that could be interesting, exquisite and stunning. Make heads turn with this 40s style cream dress. The daring V-neck in front is covered with sheer embroidered fabric, which exudes elegance and sexiness. The overall effect is a sultry style reminiscent of provocative screen sirens in the early days, plus the added high slit in front makes for a peek-a-boo hint of those long legs you want to show off. 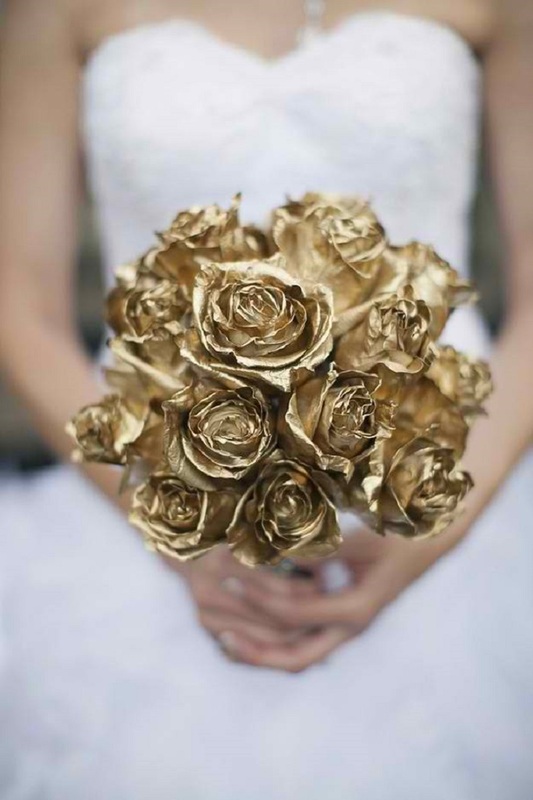 There’s no need to hold off on grandstanding on your wedding day. Showcase that hour-glass figure with this pure white gown with its sweet bell-sleeves and matching tapered skirt. Aside from the corset-style waistline in front, there are also a great back view and a long train, making this gown totally unique and multi-featured. This fully-beaded gown is a perfect choice for your winter exchange of vows. The shimmering ecru effect makes it outstanding, plus the top portion can be removed if you’ve had one too many drinks at the reception, to make way for the strapless metallic fabric effect. The black waist bow can be changed to your own color preference. 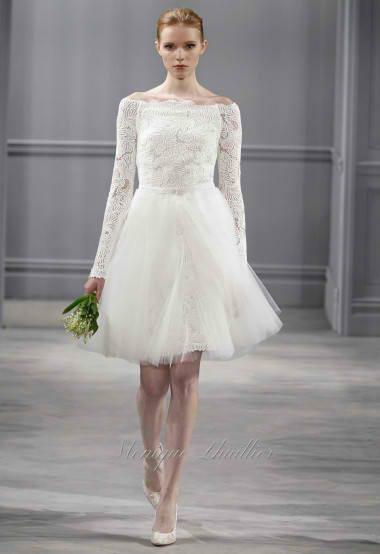 If you’d prefer a short wedding garb, a knee-length tulle dress will make you a simple but glamorous bride. Be altar-ready with pride in this lace dress with A-line skirt paired with your preferred colored pair of heeled shoes. Stand tall and proud with this sleek white ensemble, which has a daring V-neck in front, and an equally cheeky V-back. The interesting applique on the waistline, wrist and shoulder areas add interest to this attire. The tapering effect lends a slimming impression to the bride’s figure, making her truly the main feature on her wedding date. Don some fancy sleeves and look every inch a woman in this gown that will leave bystanders in awe as they see you walk down the aisle. The figure-hugging fabric gives that extra touch of femininity and grace, highlighting the bride’s natural assets. Back features include intricate lace borders showcasing a bare back, and a dramatic draping train. If you’re more into the vintage style outfits, this ballgown will set off that clock turning backwards to achieve that effect. Soft lace and tulle fabrics are still the main materials used for creating this masterpiece. Make sure to top it off with an equally classical hairstyle and accessories to complete the package. Get ready to exchange those rings with your groom in this conservatively-styled trousseau. It’s basically a strapless gown with lace covering on the shoulders and arms. With turtleneck style, and a long veil, there is also an exceptionally thick train attached to the skirt to complement this outfit. A simple chignon or similar hairdo will parallel the simple but incomparable appeal of this look. If a garden party style is your thing, then you could go with this outfit. With this one, nothing’s too complicated. It radiates pure beauty and a relaxed aura. The entire gown is made with Chantilly lace, with the sleeves and upper bodice without lining, giving it that see-through effect, while showing off the intricate lace patterns. 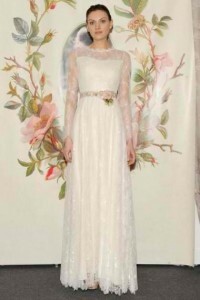 The delicate floral belt makes it appropriate for a floral-themed wedding. So you see, not showing off skin on your wedding day does not necessarily denote unattractiveness or a lack of assets. A long-sleeved wedding gown can still highlight your best features. You only need to find out the best cut appropriate for your build and make it your own. You can also complement your wedding gown with appropriate winter wedding cloaks.